I have particular demands when it comes to coffee. I favour the Starbucks Pike Place blend, I freshly grind the beans, and I use cold filtered water. I like drip coffee the best, and usually have a Grande-size worth of coffee in the morning. I like to control the strength of the coffee by adding more or less grinds, and experimenting with the extent of the grinding (i.e., fine or coarse). The Cuisinart DCC-450 is perfect for my needs. It takes a No 2. cone coffee filter and makes enough coffee for 2 people, or just myself for that necessary perk-up in the morning. It works pretty quickly and brews the full 4 cups in about 4-5 minutes, just enough time for me to empty the dishwasher. One of the key features I like about this, is that it fits on the counter-top unobtrusively, and I leave it there because it has a small foot-print and looks good with the kitchen decor. It sits beside my microwave, which is also stainless steel with black trim. There is a “brew pause” feature which allows you to pour that first cup before the rest of the coffee finishes brewing. Now, at this point you are probably wondering, what the heck is so interesting about a coffee maker review? There are two things about this coffee maker, which I admit are prefect for my needs and I use every day, which drive me completely nuts. The “brew pause” feature is not like your pause on a PVR, it is a mechanical mechanism with a spring – the special lid design on the top of the carafe engages a spring-loaded mechanism at the bottom of the drip-cone to allow the coffee to flow into the pot. Remove the pot and the spring disengages and the flow of coffee stops – or, in theory this is the way it works. Half the time I use this feature, I end-up with coffee dripping all over. It doesn’t work consistently and even after cleaning, and some inspection of the spring mechanism, there is no obvious reason why I have this problem. The second problem is that when I pour the coffee from the carafe, no matter how slowly, quickly or carefully, it is guaranteed to drip. There is something about the design of the spout that causes this problem. Again, I cannot see an obvious reason. As such, my coffee-making routine also includes paper-towel for the most-part. Sigh. Of course, with the advent of Kunig, Tasmo, and all these other one cup serving solutions – which are both wasteful and don’t make as good a cup of coffee, you can imagine there is not much competition in this product category. This is really the best option out there. I have written to Cuisnart customer service about this, and we’ll see what they say. The bottom line: A perfect sized stay-on-counter drip coffee maker, one of the few in its class, works just fine except for excessive and unnecessary dripping from the brew-pause and pour spout, works for me but search for other options before buying. I have the Cuisinart DGB-600BCA, and have the same troubles with it – though I’m not really convinced that “troubles” is the best word to use for a coffee machine that is perfect in every other way. But, as you say, the drip pause isn’t perfect – without fail it deposits a stinky burnt mess of coffee drips onto the baseplate whenever I use the function. Ideally I just try to avoid using drip pause, but sometimes there’s just no waiting for that first morning coffee…. right? The dribbly pot (by this I mean the carafe – I’m an Aussie, so it’s a pot to us) causes me to utter all number of nasty unreapeatables. When I fill my cup from a full pot it seems reasonable to expect that my angle of pour would be no more that 90°. Unfortunately, I’m instead finding that my minimum angle of pour is closer to 135°. You can imagine how ridiculous it is when I’m trying to pour the last cup of the pot – it’s just nuts! I make matters worse for myself by filling the water reservoir using the Cuisinart pot. I end up getting a steady running trickle all over the place. Why I continue to do this is beyond me, because it really does annoy the heck out of me. So, there’s my ramble! Just like you, I love this coffee maker despite the 2 problems I have with it. I’ve tried 6 coffee makers/systems in the last 2 years (I kid you not!) 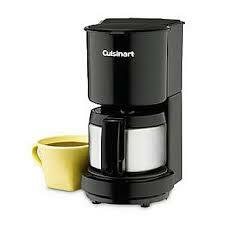 and this Cuisinart is by far the absolute best! I most certainly won’t be trying another brand after discovering Cuisinart. But…. there’s always those 2 little niggling things that my be a deal breaker for some people so it’s good to share, right? Absolutely. Thanks for your feedback! The Day My MacBook Died: Now What? Black Friday: A Tool for Making the Most of Your Hard-Earned Money?